*Data taken from official Gamma Sigma Alpha honor cord provider website on 3/12/2013. Students who are members of the Greek honor societies may be eligible to wear honor cords at their graduation ceremony to represent the effort they have made at academic excellence as well as their participation in these organizations. 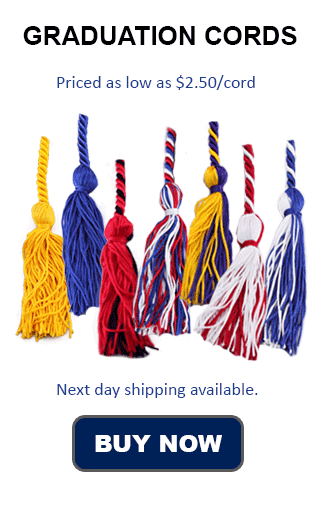 At Honors Graduation we offer honor cords in a variety of colors, including red and gold. One red cord and one gold cord are tied together to make a double cord. There are hundreds of chapters of honor societies dedicated to the Greek culture in the United States and Canada. These societies honors students who maintain a high grade point average and otherwise engage in certain campus activities or specific interests or pursuits. Wearing the Gold and Red Graduation Honor Cord on Commencement Day is a great way to show achievement and to honor scholastic pursuits. A sampling of schools with chapters of these honor societies, where the red and gold honor cord can be worn is: Western Kentucky University, University of Oklahoma, University of Arizona, San Diego State University, Murray State University, Lake Forest College, Florida State University, East Tennessee State University, College of William and Mary, and Austin Peay University. Many of these honor societies are rapidly growing. Membership not just in the United States, but worldwide, is increasing significantly each year. Don't miss out on the opportunity to get the most out of your college experience and to recognize your achievements.